In my ideal life, the one where every cooking utensil is perfectly nested in a drawer with its mates, where all of my books are organized by the Library of Congress classification system, where every piece of wrapping paper is readily paired with coordinating ribbons and bows, I am an unending fountain of creativity. That is not my life. My life consists of a perpetually messy kitchen, a chaotic set of bookshelves where C.S. Lewis' Mere Christianity is amusingly shelved next to The Lucky Shopping Manual, and a few underbed Sterilite containers that contain a smattering of completely uncoordinated wrapping papers and bags. So it is no small surprise - some would say it is utterly shocking - that last week, I pulled off not one, but two crafts that would make Martha Stewart proud. They're not my best work, but given that my life is ruled by a 3-year-old that likes to play with imaginary trains and a 10-month-old that thinks my big toe is the best teether ever created, I am fairly proud of myself. 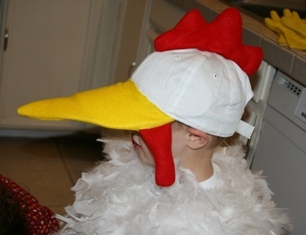 My first project was Mo's costume, whose creation began the Friday before Halloween when a family friend asked Mo what he was going to be on Halloween and he responded, "A rooster!" This was news to his father and me, as we had been planning a firefighter get-up for the big event. But Mo was insistent, and so I got to work. It only took two trips to the craft store and one late night to pull it off. My second project came the very next day, Mo's 3rd birthday. 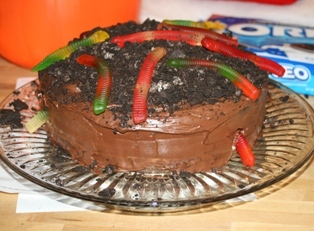 He wanted an "earthworm birthday cake," a la Max's cake in Rosemary Wells' Bunny Cakes. 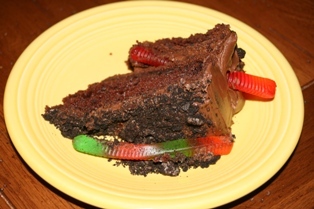 My original idea was to break up the cake into chunks, then layer them with chocolate pudding, Oreo crumbs, and gummy worms into Mo's bright red and yellow dump truck. But my toddler was not thrilled with the idea of a birthday cake that does not look like a cake (he is his father's son), so we stuck to a more traditional shape. 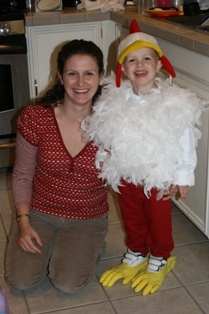 As the holiday season (and Kel's big 1st birthday) approaches, I will post more pictures of my creative prowess. I am toying with the idea of handmade holiday cards, but that is a daunting task given our gargantuan mailing list. Then again, I would feel better about the amount of television I am currently watching if I am doing something productive with my hands while I watch. What are your creative plans for the holiday season? I'd love to hear how you create-and-celebrate.